Justin Hall participates in digital culture and electronic entertainment. Present at the birth of the popular Web, Hall invested his mortal soul in the exchange of personal information online. Later consumed by machine stimulation, Hall set out to study video games to better understand his life-long computer babysitters. He finished his MFA in Interactive Media at the University of Southern California in 2007. From there Hall went on to work with the team at GameLayers Corporation as CEO as they fashioned ongoing electronic play out of daily life through “Passively Multiplayer Online Games.” Hall continues to update his personal web site at http://links.net/. Austin Grossman is fleeing through a city, fervently searching through tens of thousands of shuffling, pixellated citizens for the wide sombrero of the man who wants to kill him. Austin’s movements with the mouse are jerky, and he’s holding his breath. Suddenly he hears a loud reverberating ping off to his left. Austin whirls to face the sound. The crowd parts, and before Austin can react, the man in the sombrero shoots him down. Thatcher Ulrich watches over Austin’s shoulder, gently nibbling his finger. Austin and his colleague, Doug Church, are playing Thatcher’s game, Dueling Machine. In Dueling Machine, one player hunts another using sonar pings to find or avoid their enemy amidst tens of thousands of innocent bystanders. Few games use sound in such an integral way; this idea came from Marc LeBlanc. At the time, Marc worked for Visual Concepts, a video game development studio owned by Sega. Thatcher worked at Oddworld Inhabitants, a video game development studio owned in part by Microsoft. Given the competitive nature of the modern game industry, it doesn’t make much sense that these two would be designing a video game together. Thatcher and Marc are both working on Dueling Machine as part of the Indie Game Jam. Tired of calcification in commercial video games, a small group of game designers decided to jump-start some experimental game designs. In March 2002, they built a system for simultaneously displaying up to 100,000 moving characters on the screen at one time. Then they invited a dozen designer–programmer friends from a half a dozen game companies to join them for collective quick and dirty garage-style programming in a barn on a marina in Oakland, California. The roots of electronic entertainment lie in these sorts of collaborations, in garages and basements and dank laboratories—places where people gathered over rudimentary machines to make virtual worlds. Thirty years ago, the people responsible for electronic entertainment were not yet game professionals, they were simply dedicated hobbyists. They tinkered with computers and code to make small simulations, establishing rules and parameters that their friends would break. These tinkerers gave birth to a $20 billion industry. Electronic gaming has expanded rapidly; now 30 years later most games are made by massive teams of specialized developers working for years with a marketable product in mind. Still there are some folks who hope to encourage a generative creative spirit, to inject some creativity and vitality into a medium that’s increasingly conservative. This Indie Game Jam was organized in part by programmer Chris Hecker, who sees a games industry that is “too risk adverse.” Hecker is eager to see an independent subculture for video games; a film festival or garage band ethos feeding new ideas to commercial developers. Indie Game Jam participants in action. Top left: Chris Hecker and Doug Church working on their game FireFighter. Top right: Chris Corollo and Brian Sharp of Ion Storm working on their game Wrath. 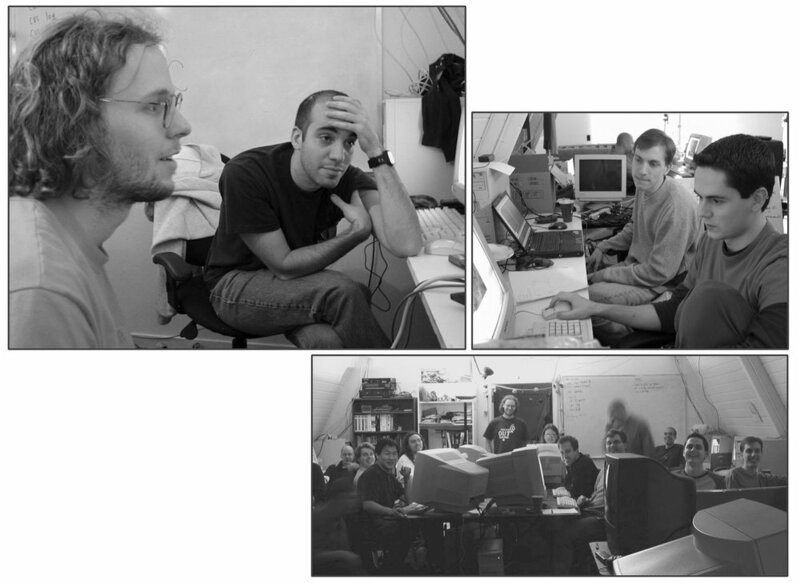 Bottom: 2002 Indie Game Jammers, left to right: Austin Grossman, Robin Walker, Art Min, Brian Jacobson, Chris Hecker, Sean Barrett, Zack Simpson, Ken Demarest, Jonathan Blow, Doug Church, Brian Sharp, and Chris Corollo. When the Indie Game Jam started, Hecker worked out of the top floor of a red barn in a cluster of Victorian buildings surrounded by bland office parks and industrial sites. This cluttered, compact office served as a retreat for a revolving cast of independent programmers—laptops working on a futon propped up with old CPU cases between stacks of old graphics cards, books on math theory, and antique PC games. Hecker opened up his Oakland office to serve as the site of the first few Indie Game Jams. Over a bowl of dry noodles at a nearby Vietnamese restaurant, Hecker speaks passionately about the evolution of gameplay: “Games of the future will be interactive not only at the second-to-second level, which we focus on now, but also at the minute-to-minute and hour-to-hour levels. This means that not only can you walk left or right interactively, but your decisions impact the overall flow of the game.” Deeper interactions require richer simulations; Hecker gets excited about physics, the system of game rules determining interactions between physical objects in games. Do you want to stack those crates over there against the door to keep the bad guy from following you into this room to eat you alive? As Hecker points out, most games today won’t allow that kind of strategy. Crates are for climbing on or smashing up only. In March 2003, the second Indie Game Jam replaced 100,000 sprites with one main actor—the human body. The usually crowded Indie Game Jam headquarters were packed with projectors and webcams taped to the top of halogen lamps and hanging off other hazardous supports. Building on Zack Simpson’s Shadow Garden engine, 14 programmers had one weekend to design games that used the shadow of a human body cast on a wall as an interface for electronic entertainment. Casey Muratori and Michael Sweet created Owl Simulator, where a player’s outstretched arms controlled their flight path. In Atman Binstock’s Squisy Marshmallow Maze, two players struggle to move their colored block through a maze, using their shadow to block the progress of the other player. Squisy Marshmallow Maze games typically devolved into wrestling matches, a kind of physicality mostly unseen in video games until the advent of the Nintendo Wii, years later. In 2005, the fourth Indie Game Jam used an engine with human models from The Sims to make games about human interaction. By then, Indie Game Jam contributors included people drawn from other disciplines beyond programming: art, sound design, game theory, and education. And now Indie Game Jams were occurring elsewhere. In Lithuania in 2002, a group of young programmer/designers got together in a room, made games on a short deadline, and released them free online, using the first Indie Game Jam engine. Soon Toronto, Dallas, Boston, Ohio, and Nordic Game Jam groups launched, listing themselves on the Indie Game Jam page on Wikipedia. Within years, schools, companies, and developer groups around the world were spending occasional weekends to hack at electronic play: professional and amateur programmers alike unleashed by a weekend of fast prototyping in a shared, supportive atmosphere. As commercial game industry budgets grow to accommodate ambitious graphics and rigid licenses, these kinds of development experiments give people a chance to poke at new ideas. Some rather mainstream developers are finding happiness in smaller, informal collaborations, some of which even evolve into commercial titles sold as PC or console downloads. A weekend-long Indie Game Jam is usually not enough time to develop deep, engrossing games. Most of the participating programmers must leave happy fun prototyping land for their day jobs, and participating designers might not have the technical skills, tools, or time to accommodate big visions. For people who spend their days working on large, slow moving entertainment software, an Indie Game Jam gives them a compressed freedom where personal inclination and a sense of playful experimentation direct game design more than market concerns. On the last day of the first Indie Game Jam, most of the games had been finished and many of the programmers had headed home. Sean Barrett stood over Chris Hecker’s shoulder as Hecker’s dirty glasses reflected tens of thousands of tiny figures being mowed down by a single warrior on-screen. As Hecker handily killed with mouse and keyboard, the camera panned out slowly until his character was shown to be surrounded by an impossible sea of enemies. There was clearly no way he could survive. The artful futility of Barrett’s Very Serious RoboDOOM put a wide grin on Hecker’s face. Each Indie Game Jam begins to explain how games can meet broader social needs: beyond athlete, gangster, and space marine power fantasies. Beyond our current vocabulary of “first person shooter” and “real time strategy.” Past “attack” and “jump,” where “manipulate” and “convince” are possible game verbs. Where learning to make your own rough draft games is part of being an active player. More information about the Indie Game Jam can be found online at www.indiegamejam.com and on Wikipedia at en.wikipedia.org/wiki/Indie_Game_Jam.